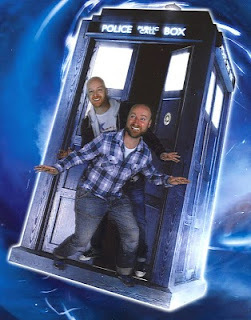 Dean and I ventured down to London's Olympia 2 on Sunday afternoon to see if we could gain entry to the Tardis. Or Tardises to be more precise. We were sure Doctor Who wouldn't mind. The Doctor Who Experience is running for a ten months and contained within it a special effects show in which the 'shoppers' (i.e. us) took part (the experience bit) and an exhibition of costumes, props, audio, special effects, interactive exhibits and artefacts from said show. We loved it. We gasped, we oohed and we aahed. The highlight was probably the Dalek war on the bridge of the Dalek spaceship. Or maybe it was the 3D monster climax. Or the giant K1 Robot. They were all a highlights! It was a veritable Whovians delight. Many more pictures here (and below).